“Master Connections” With Pianist Michelle Kim, Violist Meidad Yehudayan, Cellist Si Won Park, Clarinetist Seunghee Lee, Bassoonist Vance Lee, Marc Gelfo, French Horn. This public Masterclass workshops brought to you by world class musicians will give an unforgettable experience in arts and music for students of all ages. This interactive exchange between artists and audience is designed to inspire creativity, foster development and promote artistic excellence. Pianist Michelle Kim has captivated audiences all over the world with her unique blend of pianistic power, poetry and striking stage presence. Ms. Kim has performed in concert halls throughout the US, Europe and Asia including performances at Carnegie Hall, Lincoln Center, Caramoor, the New Jersey Performing Art Center, the Sejong Cultural Center, the Hong Kong Cultural Center, LACMA and the Chicago Cultural Center. She has performed as a soloist with numerous orchestras across the world including the New Jersey Symphony, the Brevard Music Festival Orchestra, the Seoul Philharmonic, the Xiamen Philharmonic, the Bergen Philharmonic, the Orchestra del Teatro Massimo di Catania, among many others. Her performances have been televised in the United States, Italy and South Korea and broadcast on radio stations throughout the US including NPR, WQXR, K-Mozart and WFMT. Recently, Michelle Kim was featured as one of the “Inspiring Women of Hong Kong” in the October 2013 Anniversary Issue of Marie Claire for her charity work in Hong Kong. Ms. Kim is the founder and artistic director of Hong Kong Generation Next Arts (HKGNA), a Hong Kong Charity dedicated to nurturing artistic excellence and personal success in young artists and transforming lives through music. She has performed numerous concerts to raise money for Hong Kong charities including performances with violinist Lu Siqing and the Metropolitan Youth Orchestra at the Hong Kong Cultural Centre and” Concert of Power” event with Nick Vujicic. Born in Seoul, Korea, Ms. Kim began her musical studies at age four. At age ten, she gave her orchestral debut with the Seoul Philharmonic Orchestra. She went on to graduate from The Juilliard School earning both a Bachelors and Masters of Music. She was also the recipient of the prestigious Arthur Rubinstein Award and garnered top prizes in national and international competitions including the Bartok-Kabalevsky-Prokofiev International Piano Competition and the Vincenzo Bellini International Piano Competition. A native of Israel, Mr. Yehudayan performs around the world, as a soloist, recitalist and chamber musician. He recently performed at the International Chamber Music Festival of AMEROPA in the Czech Republic and a few Concertos in USA, Hong Kong, Korea and Israel. Mr. Yehudayan was also invited to play solo at the main event of the World Peace Festival 2005 in Korea in which all proceeds from the festival were donated to Unicef. Past few years’ projects include solo and chamber music concerts with members of the Berlin Philharmonic and the Hamburg symphony, as well as CD recordings with Hong Kong Pure Strings. The first CD, “Popsinera”, was awarded “The 10 Hottest CD of the year 2008” and “The Best Light Music Album of the year 2008” by the Radio Guangdong “Voice of the City.” The second CD “Surprise – Happy Birthday” was awarded the “Best CD of 2009” by Canton Radio. This is one of the biggest awards in China which incorporates playing, music selection and arrangements. Mr. Yehudayan also gave master classes in Indiana University and California, and was a jury member at the International Vienna Music Competition and Hong Kong Bauhinia Cup Strings Competition 2012. Mr. Yehudayan received his Bachelor of Music Degree and Artist Diploma in the Faculty of Performing Arts from the Jerusalem Rubin Academy of Music and Dance. There he studied violin and viola with Prof. Samuel Bernstein, a renowned teacher and the first mentor of Gil Shaham. He had the honor to be the first and only Israeli student to be sent to the Moscow Tchaikovsky Conservatory in Russia from which he received a diploma under the guidance of Yuri Bashmet and Prof. Fiodor Druzhinin. Subsequently, he acquired his Master of Music Degree from the Manhattan School of Music, where he studied with Michael Tree, violist of the Guarneri String Quartet and Pinchas Zukerman. Mr. Yehudayan was a member of the Hong Kong Philharmonic Orchestra and the Hong Kong String Quartet between 1995-2001. He participated in the Geneva Competition in 1992 and was a prizewinner of many competitions in Israel. He has performed many recitals in Israel, America and Europe, and recorded for Israeli National Radio & RTHK (Radio 4) in Hong Kong. Mr. Yehudayan is the violist of the Pure Strings Ensemble and Orchestra and Strings Director at Hong Kong International School since 2000. A native of Seoul, Korea, Ms. Park won the 1997 Artist International Competition and was presented as the Recipient of The Special Presentation Award in her New York Recital Debut at Carnegie Hall. Her solo appearances include performances of the Haydn and Saint-Saens Concertos in Carnegie Hall, New York and in Korea, as well as the Brahms Double Concerto in Hong Kong and Korea. Recent recitals took her to Kumho and Young San Art Halls in Seoul and City hall in Hong Kong. Ms. Park was also invited to be a jury member at the VIMC Vienna International Music Competition. Ms. Park studied at The Juilliard School and later on graduated from the Manhattan School of Music, where she received her Bachelor’s and Master’s degrees under the guidance of Paul Tobias, Zara Nelsova, Myung Wha Chung and Ardyth Alton. While attending at Manhattan School, Ms. Park had the honor to be recipient of the President Marta Istomin Award and the Hans & Klara Bauer Cello Scholarship. Her chamber music coaches were Jerry Grossman, Nathaniel Rosen, Yehuda Hanani and Alan Stepansky as well as members of the Guarneri, American & Vermeer String Quartets. Ms. Park participated in the music festivals of The International Symphony Orchestra, Israel, The National Orchestra Institute (MD) and National Repertory Orchestra (CO) among others. As a recitalist, chamber musician and soloist, Ms. Park has performed in Asia, Europe and the U.S.A. She gave quartet recital at Alice Tully Hall in Lincoln Center, played in Musicarama – the International Contemporary Music Festival Concerts and recorded for RTHK (Radio 4) in Hong Kong. Si Won Park is a prizewinner of other competitions including the Weschester SUNY of 1992 Korean Monthly Music Magazine Competition of 1989 and the Youth String Orchestra Competition of 1987. Praised by music critics, clarinetist Seunghee Lee has been reviewed as a “brilliant clarinetist” by the Fanfare Magazine, and the Clarinet Magazine of the International Clarinet Association has recognized her as “an uncompromising soloist destined to be an upcoming contender of top stature”. Upon release of her debut album “Brava” with Summit Records, captured by multi-Grammy award winning producer and recording engineer, Joanna Nickrenz and Marc Aubort of NYC, Seunghee was featured as one of the “Top 30 Classical Stars Under 30″ by KDFC, San Francisco’s classical radio station. After some time off from music, Seunghee returned back to recording and produced her second CD, “Embrace” which climbed HMV Classical Charts in Hong Kong to #4! Her new found passion and inspiration comes from broadening the limited clarinet repertoire by arranging beautiful classical pieces for the clarinet and piano. Seunghee’s third CD production entitled, “Hidden Treasures” is soon to be released. Seunghee is the recipient of numerous competitions and awards, including First Prize at both the International Clarinet Association Competition and the Saint Louis Symphony Young Artist Competition, judged by Leonard Slatkin, the Yale University Woolsey Hall Concerto Competition, the Music Academy of the West Concerto Competition, and Yale’s Charles Ives Scholarship. At the 2013 International Clarinet Association ClarinetFest, held in the mesmerizing city of Assisi, Italy, Seunghee premiered some of her own arrangements including Brahms Poco Allegretto from the Symphony No.3 and Chopin Nocturne in C minor for clarinet and piano. Seunghee received her Bachelor’s degree from Eastman School of Music under the tutelage of Charles Neidich and earned her Master’s degree and the Artist Diploma at Yale University with David Shifrin. 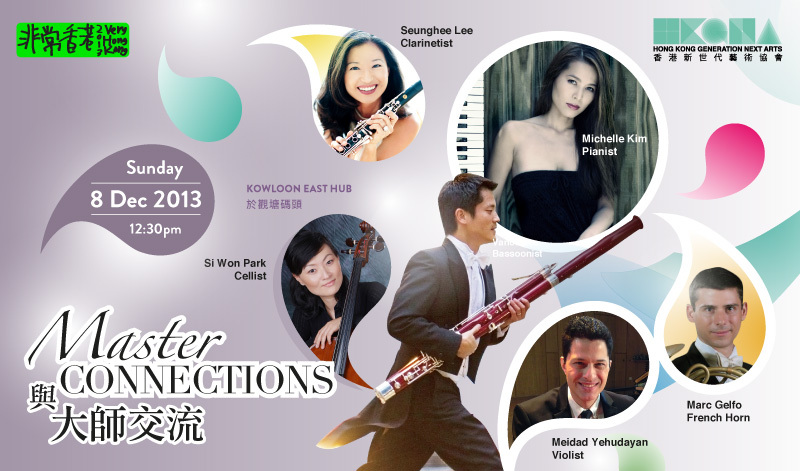 Vance Lee is the Assistant Principal Bassoon of the HKPhil. Before taking this position in September 2000, he was the Principal Bassoon of the Hartford Symphony and Connecticut Opera Orchestra, in the USA. He has appeared as a concerto soloist with the Hartford Symphony, the National Repertory Orchestra and the SAR Philharmonic, performing works by Mozart, Weber, Vivaldi, Haydn and Hindemith. He has performed solo and chamber music performances in Hong Kong, Los Angeles, Manila, Cleveland, and Hartford. Mr. Lee studied at the Cleveland Institute of Music with David McGill (Principal Bassoon of the Chicago Symphony Orchestra). Much of his inspiration came while participating in summer music festivals: Tanglewood, Bloosom, Sarasota, Eastern, The Sir Georg Solti Orchestral Project at Carnegie Hall, National Repertory Orchestra, Music Academy of the West, and ISOMATA. Inspired by playing under the Batons of Maestros Sir Georg Solti, Bernard Haitink, Seiji Ozawa, and Charles Dutoit, Mr. Lee made his Hong Kong conducting debut with the HK Chamber Orchestra in 2008. The program was Mozart’s Overture to the Marriage of Figaro, Shostakovich’s 2nd Piano Concerto (Warren Lee, piano) and Beethoven’s Seventh Symphony. Born and raised in Santa Monica, California, Hong Kong is now home, with wife, Louise Lao, and sons, Joshua, Lucas and Zachary. In his spare time, he enjoys golf. Marc Gelfo grew up in the sunny town of Vero Beach, Florida, where he first studied piano, violin, cello, and finally, was captivated by the unique sound of the horn, which he played throughout middle school and high school. He attended Northwestern University to study cognitive science, computer science, and Chinese, graduating in 2004. Afterwards, Marc returned to his passion for music and enrolled at Indiana University to study horn performance and audio engineering. While at Indiana, he studied with Myron Bloom, Michael Hoeltzel, Richard Seraphinoff, and Jeff Nelsen, and was a participant in the Aspen Music Festival. Marc spent 2006 and early 2007 performing with the Macao Orchestra and the Orquesta Sinfonica de Navarra in Spain, and he later became a full-time member of the Macao Orchestra. He joined the Hong Kong Philharmonic in 2008. In addition to classical music, Marc performs jazz, funk, and experimental/electronic music on the horn and has been a part of several improvisatory collaborations.